Often fashion bloggers' outfits can seem totally unattainable unless you have the budget for Chanel. However, there are a number of Instagrammers who fly the flag for the high street. There are five influencers in particular who always wear the best of what's in store at Topshop, H&M, Zara and the like. Scroll below to let us introduce you to the fashion bloggers to turn to for affordable outfit ideas. Emma Rose Thatcher of A Style Album always finds the best dresses on the high street, such as that & Other Stories rainbow dress. If you're still looking for the perfect dress for your summer weddings, we recommend turning to Em. On Megan Ellaby: ASOS Beach Wrap Dress in Gingham (£26); Forever 21 Pom-Pom Faux Suede Heels (£23). From incredible ASOS finds to making us lust over Forever 21 sandals, Megan Ellaby manages to showcase a great mix of high-street and luxe brands. On Emma Jane Menteath: Mango Tropical Print Shirt (£30). We've only recently discovered Emma's work as a blogger. The fact that she's a model, however, comes as no surprise, thanks to her ability to spot a decent high-street bargain and make it look super expensive. On Emili Sindlev: ASOS Golden Floral Bardot Midi Dress (£68). Copenhagen-based fashion stylist Emili Sindlev often introduces us to the best pieces on the high street, as her wardrobe is largely built up around Scandi high-street brands such as Weekday, H&M and Monki. On Natasha Ndlovu: & Other Stories Shirt (£59); Topshop Jeans. Natasha Ndlovu might have dream designer accessories (hello, Chanel bag), but her clothes tend to be from the high street. She wears Topshop jeans, H&M leggings and has a soft spot for & Other Stories. On Alex Stedman: H&M Chiffon Dress (£40). 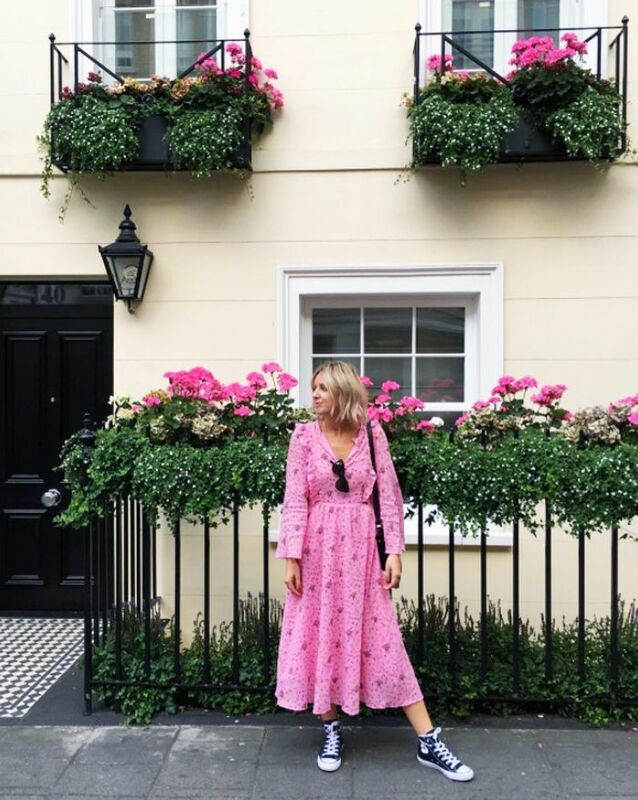 Alex Stedman's blog, The Frugality, is all about making smart fashion choices, so she is one of the biggest champions of the Great British High Street and often wears Next and M&S. On Lucy Williams: Topshop Floral Frill Bardot Dress (£39). Lucy Williams might shop on Net-a-Porter, but she is a master of the high/low mix as she also wears as much Topshop and Mango as she does Chloé. On Soraya Bakhtiar: Zara trousers and top. Like many of our readers, Soraya Bakhtiar has a real weakness for Zara trend pieces. She might be wearing Miu Miu platforms, but often her clothes are head-to-toe Zara. Next up, see our edit of the best pieces in the summer sales.